Back in the day Raj Janan’s father was a successful industrialist in Jaffna, owning at various times an aluminium factory, a knitwear factory, a private hospital and a newspaper. Janan’s childhood was disrupted by the JVP insurrection in 1971 when he was 11 years old. One consequence of which was the family was split, with mother and sister stuck in Colombo and the father and two brothers in Jaffna. In this period, without direct maternal support, Janan asked his father for a job in the aluminium factory. Looking forward to a cushy management role befitting the boss’s son, he was issued with a broom to sweep the warehouse. After a couple of weeks he was promoted to teaboy, in charge of boiling water in a big pot over an open wood fire. Janan says he tried crying, but his father was unmoved. Having perfected his tea making skills, able to serve 50 workers at a time, Janan was elevated to operating the factory machinery. It was in this period, says Janan, that he learned to empathise with the common people. People who at the end of the working day he would join to bathe at the well. An empathy for which he remains grateful to his father, not to mention his skills with brooms and pots of boiling water. 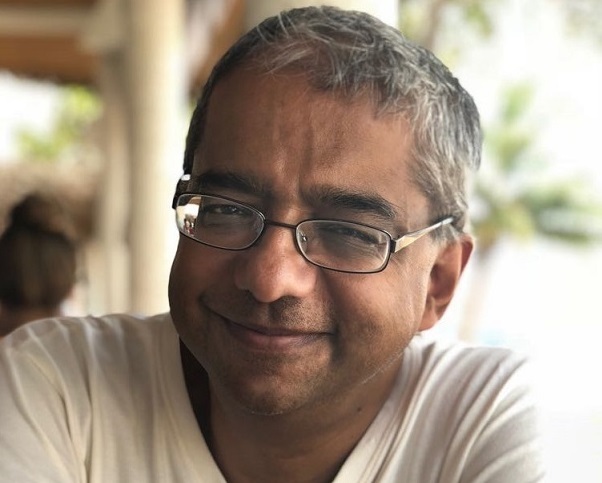 After studying at Central College and St John’s College, two of Jaffna’s leading schools, Janan left for India in 1977 to do the “pre-university” course and then apply for university. Qualifying to enter the medical faculty, to the disapproval of his father Janan instead joined Bangalore University’s Department of Agriculture. Some years earlier, when he was 12 years old, Janan’s father had bought a 40 acre estate in Iyakkachchi a little north of Elephant Pass. Every weekend he went with his father to work on this land, creating a passion for agriculture in the young boy. Four years later, Janan returned to Sri Lanka from Bangalore and joined a Norwegian NGO doing agricultural research. The Norwegians were studying the traditional indigenous organic agricultural methods, and how they improved the soil. In 1984 Janan was driving with one of the Norwegians near Jaffna University when they saw the actual shooting of a person tied to a lamppost. Having stayed through the communal riots of 1983, this experience of witnessing a “live shooting” caused the Norwegians to decide it was time to leave. However, they helped Janan win a prestigious NORAD fellowship in Norway where he spent a year. He then joined NORAD, Norway’s development aid management body, with whom he worked in Israel, Palestine, and Egypt. Janan said he talked himself into these postings by citing his experience living in a war situation in Jaffna. He admits the lack of other applicants for these hazardous postings was also helpful. Perhaps Janan had second thoughts when, during the Palestinian Intifada in 1988, he was mistaken as a Palestinian by Israeli soldiers. The resulting beating left him with three broken teeth, though the soldiers were very apologetic when he explained he is Sri Lankan. They even drove him back to his hotel and left him at the bar to medicate himself. The soldiers returned the next day to take Janan on a tour to the Mount of Olives and other famous sights, such was their remorse. Janan left NORAD and migrated to Canada. He then moved to the USA where he worked for various environmental bodies including the Environmental Protection Agency (EPA), the Hazardous Waste Research Institute, the Illinois State Water Survey and the Land Monitoring Agency. His work included developing a GPS (Global Positioning System) application to map the massive USA farmlands. Back in the 1980s/90s the GPS system that now fits invisibly in your smartphone required a large backpack with a long antenna poking out of it. Cutting edge though that great big backpack then was, Janan was tempted by a friend to retrain as a database administrator and pursue the high rewards available for technologists on Wall Street. His friend spent 6 months of his spare time training Janan. Janan then successfully applied for a database administrator job at JP Morgan, a leading Wall Street investment bank. It occurred to Janan that if “if a fool like me” (in his own words) can get a job at JP Morgan with 6 months ‘spare time training’, he should be able to get unemployed computer graduates, train them up and send them out as consultants. Starting with Samath, Bala and Walter, three guys from Sri Lanka in New York looking for work, Janan and his business partner Sanjay started training and hiring out tech consultants to Wall Street firms. In two years their business had grown to 250 staff. Their company was twice named by Inc Magazine as one of USA’s fastest growing companies. Janan and Sanjay took their company public in 2005, and Janan exited selling his shares in 2007. In 2005, after the 2004 Tsunami, Janan came to Sri Lanka for a few months to work on building houses with SOS KinderDorf, also known as SOS Children’s Village. Here he met his current business partner John Tastad from Minnesota, USA. John is a successful American entrepreneur and investor who has built technology companies and has a passion to work in developing countries. Back in New York John, the technologist Dr.Priyan Gunatilake and Janan setup an energy company, focussed on monitoring and controlling domestic energy usage. They invented a technology for this, and patented it, describing it as “A utility monitoring system and method for relaying to a consumer personalized utility consumption information in order to induce the consumer to conserve the utility.” Unfortunately the launch of the product coincided with the global financial collapse of 2008, which swept away many businesses including theirs. Their patent remains on file, so perhaps one day they will come back to it. In 2009, after the Sri Lankan Civil War ended, Janan decided to do something with that Iyakkachchi farm his father had bought when Janan was 12 years old. An estate that once had 2,500 coconut trees, 150 mango and 60 cashew trees, and a multi-tank irrigation system had been destroyed in the fighting. All that was left was 175 bullet ridden trees, overgrown jungle, and scattered unexploded munitions. 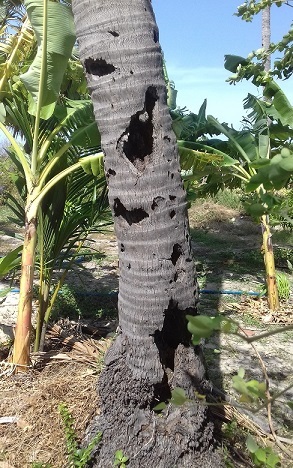 I myself am amazed how much damage a palm tree can take and still bear fruit. Janan tried to revive the farm by sending money and instructions while he himself lived in New York with his wife and daughters. Coming to Jaffna just once or twice a year for a couple of weeks at a time to check progress proved useless. The farm was showing little improvement. So Janan decided to identify a business opportunity, and move back to Jaffna long term. Sri Lanka has two major coconut regions. These are sometimes called the Coconut Triangle, with corners at Puttalam Kurunagala and Colombo, and the Coconut Belt which runs in the Jaffna Peninsula along the A9 from Iyakachchi to Chavakachcheri. While the industry was thriving in the Triangle, the civil war had devastated the Coconut Belt along with much of the rest of the North. Janan researched opportunities to rebuild out of this devastation, and came across coconut fibre and cocopeat products. 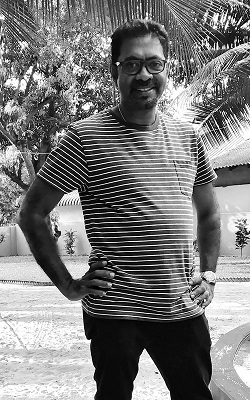 With excellent support from the Coconut Development Authority and in particular from the Coconut Cultivation Board (CCB) in Jaffna, Janan came up with a business plan. Rather than setup an enormous estate, Janan wanted to bring prosperity to small coconut growers in the North. The CCB has about 330 cooperative societies in the North. Janan entered into agreements to purchase coconut husks from them, paying both the growers individually and also paying a commission to the societies. And he employed women from the local communities to process the husks. Janan went to his Minnesotan friend John Tasted, who agreed to join him in the project. John setup conference calls with US investors, and Janan pitched his business ideas over the phone from Jaffna. Having identified interested investors, Janan and John met them in New York and soon found what they needed to start the business including money and markets. Thus was their company Sakti Agro created, https://www.saktiagroglobal.com/. With the able assistance of the Board of Investment, both in Colombo and in Jaffna, a company was setup in Sri Lanka with an initial investment of half a million US$s. This investment has since increased significantly. Things didn’t go smoothly, and lessons were learned quickly and painfully. For example, Sakti imported machinery from a supplier in India who delivered incomplete consignments late and provided poor support. Janan and his staff taught themselves how to get things working by trial, error, and YouTube videos. 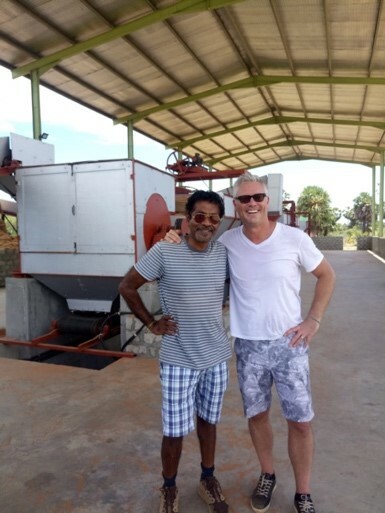 Janan said with hindsight he could have bought the machinery in Sri Lanka, but there were few in the local coconut industry who were willing to advise what they saw as a competitor. Fortunately, Sakti’s investors were patient, and inspite of an 11 month delay they stuck with him. Sakti’s primary products come from coconut husk dust. A coconut husk is approximately one third fibre and two thirds dust. Traditional products use the fibre, to make mats and brushes and to stuff mattresses. While the dust is often thrown away. Sakti makes Cocopeat with the dust, both loose and in bricks, which is used as a plant growing medium. Janan returned from North America bringing with him key capabilities. Not just his knowledge of agriculture, and his knowledge of Sri Lanka and the Northern Province. He brought his experience setting up companies, finding investors, growing the companies, floating them and exiting them making money for himself and his investors. He brought the contacts he had made with investment companies and with individual high net worth investors. He brought his understanding of the overseas markets, and their demands for quality and reliability. The North is rich in raw materials including seafood and agricultural produce. However, instead of adding value to them here in the North we sell them as they are harvested, raw, getting paid a pittance. Wet seaweed and coconut products are sold for a few rupees per kilogram, raw seafood is sold for a fraction of its retail value. Lack of storage facilities results in fruit and vegetables being sold at low prices in high seasons instead of being kept to be sold at high prices in low seasons. The North is also rich in human talent, which we allow to leave to go South and overseas due to lack of opportunity here. But that’s a story for another time. To all the Diasporans out there waiting and wondering what opportunities Jaffna and the Northern Province offers them, I will rephrase the late US President John F Kennedy’s words: “Do not ask what Jaffna can offer you, ask what you can offer Jaffna”! The North needs to be kick-started by those who will take some risk. Once that is done there will be enough opportunities for those who won’t.